Tina Marie - Forever and Always: "2"
Hi there and a very warm welcome to you. Thanks for popping bye today. I have a special share for you today. It has been so long since I have done a vintage layout and I have been bursting at the seams to do one ever since my MIL passed on some most wonderful photos of family. I must admit that I don't know who most of these people are but I am learning quickly! So today is a wedding photo of my husbands Grandmothers sister....Dorothy. She was such a stunning woman. I am unsure where abouts the photo was taken but be assured it is on my list of questions to ask. 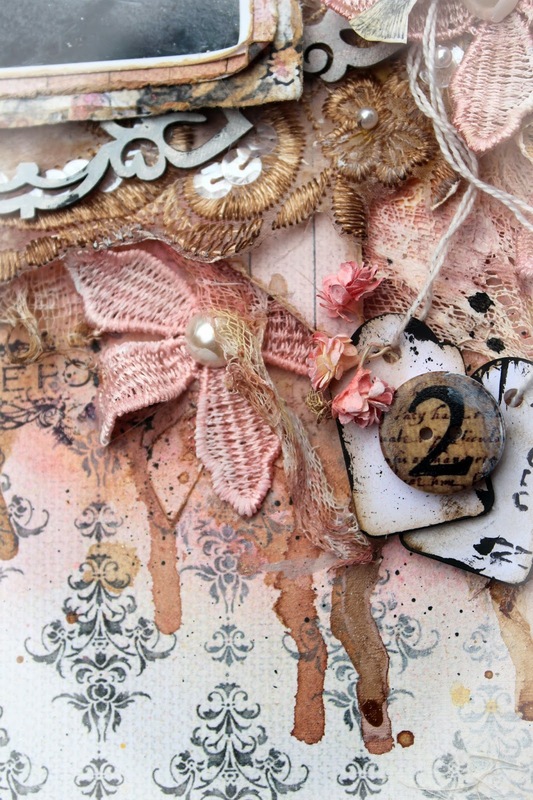 So this layout was completed using Fabscraps "Elegant Chic"and yes I know you have heard it all before but these paper and chipboards are just divine. This is my fourth layout and I am on my fifth at present. It is sitting on my table half finished. 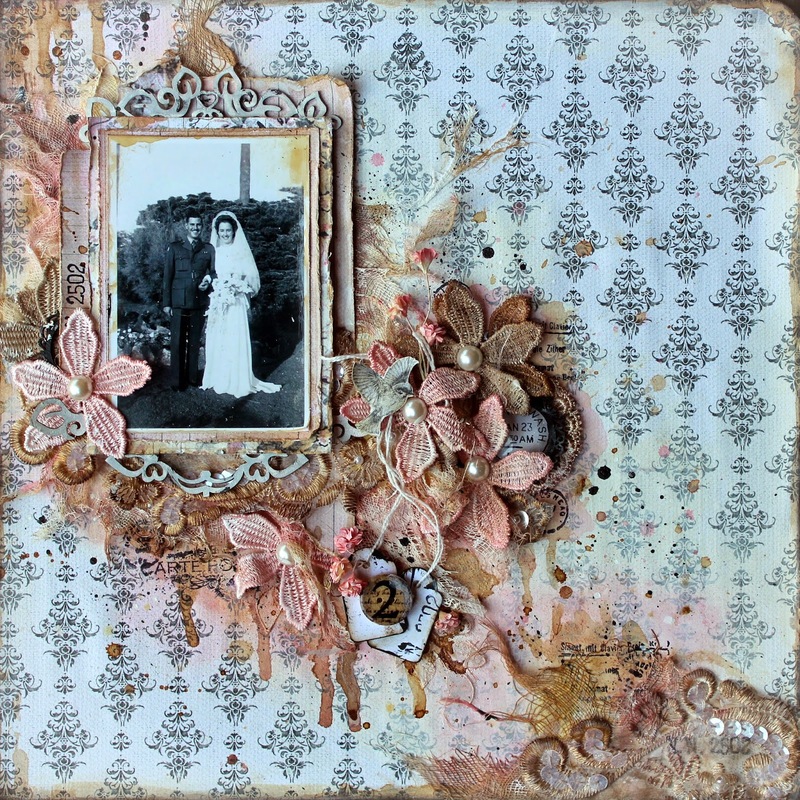 I have dabbled in some mixed media for this layout bringing out the gesso and misting sprays, but I have mostly used coffee on this with lots of lace and trims that I have dyed using my mists and coffee. I hope you enjoy this as much as I did creating it. I have titled this one "2". For this layout I have used lots of coffee to stain the layout with drips and splatters. The flower trim that you can see above have all been dyed with either coffee or mists. I have used Vintage Pink here.....beautiful colour to co-ordinate with coffee and black. I have also used a little Sunflower (yellow) mist here and there. Along with the lace motif and flower trim I have included some cheesecloth and mini lace doilies. 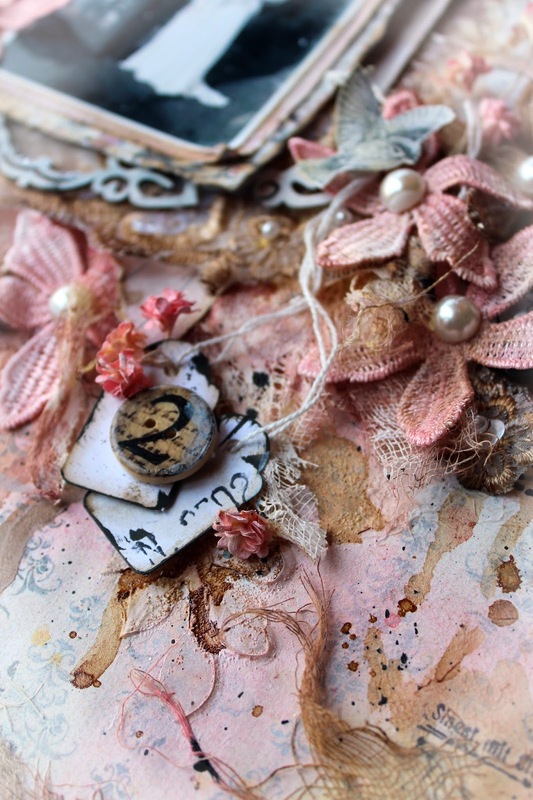 The Fabscraps chipboard used here is a piece called Elegant Chic. I have simply cut this piece in half and cut out the wording from the centre, gessoed and ink it and adhered it top and bottom of photo. Keep scrolling for a product list and full detailed instuctions. Well that's all from me, I hope you have enjoyed this layout and I hope to see you here again soon. 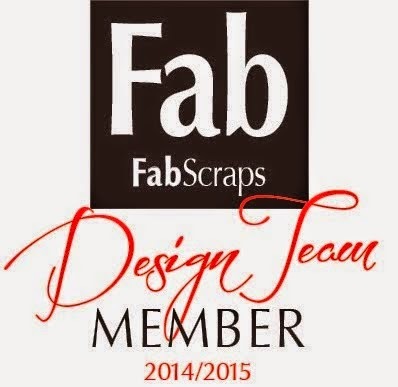 Take Fabscraps "Fleur" patterned paper and adhere to a sturdy background ( I have used Chipboard for this). Coat base paper with clear gesso and heat set. Run a brush of cooled coffee around the outside of base paper and again heat set. Ink edges of base paper with Black Soot distress ink. Soften a section of your patterned paper running from top left to bottom right of layout using a sponge and white gesso. Wipe off excess with a baby wipe whilst blending. Do some stenciling with impasto and heat set. Run a piece of cheesecloth from the left hand top to the right hand bottom of your layout. Cut a section out at about 3/4 of the way as shown in layout. Secure with Gel Medium and heat set. Using misting sprays and ready-made precooled coffee colour your background. Apply some stamping randomly around the layout with Jet Black Archival ink. Take a lace motif and dip into your coffee. I washed mine off with a little water afterwards so it wasn't too dark. Dry and cut a section out to sit at the right bottom corner of layout. Adhere ontop of the cheesecloth. 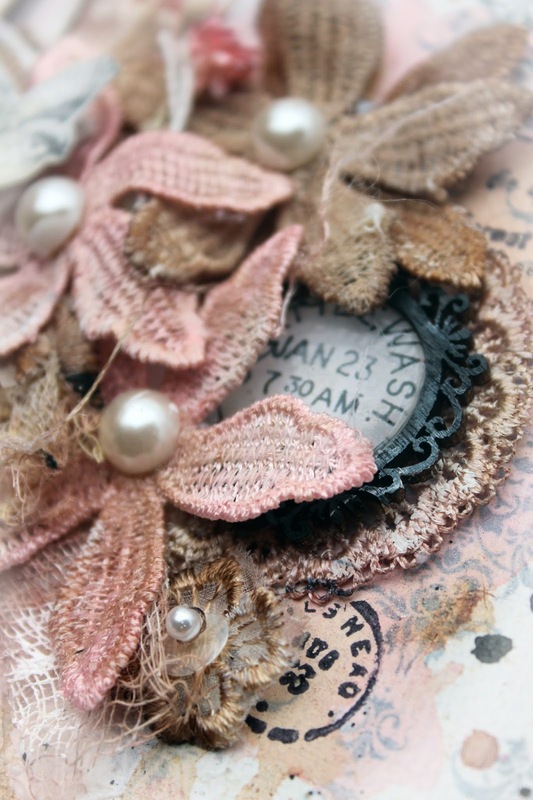 Cut from remaining Fabscraps patterned papers of Flying Bird and Shabby Flowers matting pieces to sit your photo on. I have cut 4 differing sized pieces Distressed each and run a brush of coffee around each and secured them behind the photo using mounting foam. Adhere to top left of layout as shown. Tuck in remaining motif piece at base. Prepare chipboard by coating with gesso (White). Heat set and ink with Pumice Stone Distress ink to give and off white colour. Cut in two and cut words from the centre. Adhere one piece at the top of the photo and one at the base of the photo as shown. Mist Flower Trims and smaller flower sprays and dry each. Adhere to layout as shown. Adhere pearl centres to each flower trim. Tuck in a mini doily and adorn with a cabichon and frame at right of photo. Fussy cut flying bird ink with a little Antique Linen Distress Ink and mount atop of flowers at right of photo. Ink edges of a couple of pricing tags with black ink and also a little walnut stain distress ink. Wrap string from tags around flower cluster and let drop down. Adhere where it falls. Adorn the tags with a wood button. This is my title "2". Finish off with splatters of black ink and coffee and heat set. Your layout is now ready to frame and hang!! Such a beautiful layout Tina with so many wonderful details. Gorgeous photo too. Really beautiful layout, love the blooms and what a precious photo too! Wow this is a stunning heritage layout! Awesome! Hi Chantal....thanks so much for your lovely comments and thank you for popping by...! Thanks so much Sarah and thanks for popping by!